1 // Merry Pugmas Christmas T-Shirt - It's not a jumper but.. I love Pugs! I want a Pug! But a Christmas T-Shirt is the closest I'll ever get to one! 2 // Fairisle Jumper with Collar - I've never seen a christmas jumper with a collar before, this is so cute! 4 // Elizabeth All Over Patterned Jumper - Monochrome? Yes please. 5 // Snowflake Boxy Sweater - Ahh, sequins! 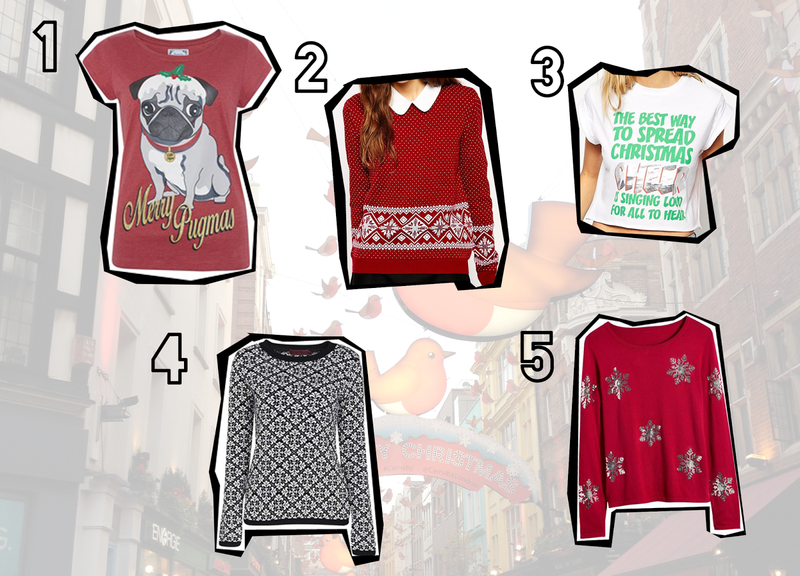 The tackier the Christmas Jumper, the better! I've never owned a Christmas Jumper before, if you get them, let me know in the comments when you wear them because I couldn't imagine wearing one on a day-to-day basis! I love number 5! I usually wear mine on Christmas eve, Christmas day and boxing day, but usually just for parts of the day because it can get a bit hot! I think it's National Christmas Jumper Day on the 12th though, so I'll be cracking mine out then as well! What do you use to create your wishlists etc?